EUROPE: Switzerland-based intermodal transport operator Hupac carried 763 101 road consignments by rail in 2017, an increase of 3·5% on the previous year. This was despite the seven-week blockade of the Rhine Valley route near Rastatt, which resulted in the loss of more than 30 000 consignments. Traffic in the first six months of 2017 had been up 8·3% year-on-year, but the second half was affected by major engineering works, notably a six-month closure between Bellinzona and Gallarate. The collapse of the trackbed at Rastatt affected a route where Hupac normally operates 300 trains per week. Less than a third of these could be rerouted, while around 50% of the traffic was moved to River Rhine shipping and customer-organised lorry shuttles. Hupac said a ‘Rastatt effect’ was seen not only on trans-Alpine transport through Switzerland, but also on Swiss import and export traffic via Benelux. However the situation normalised quickly once the railway was reopened in early October, enabling Hupac to achieve the overall 3·5% increase. Trans-Alpine transport via France increased by 13·0%, while trans-Alpine transport via Austria declined 2·2%. 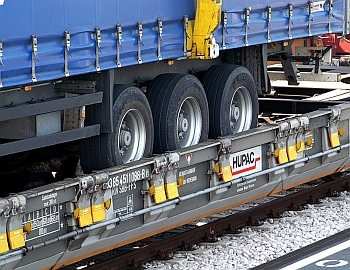 Hupac now operates around 110 trains per day, with 450 employees and a fleet of 5 500 wagons. The company expects ‘active demand’ to continue in 2018, and has a number of projects underway to ensure reliability and safety. 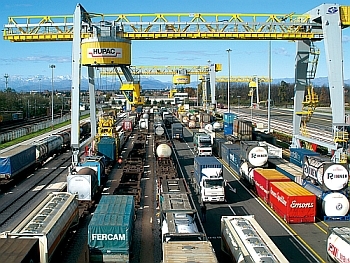 These include work at the Milano Smistamento, Piacenza and Brescia terminals which will provide new capacity ready for the completion in 2020 of the cleared corridor to accommodate 4 m high loads. Hupac is also seeking to diversify its routes and develop back-up plans to mitigate the risk of lines being closed in the future. Services being developed include Hannover – Novara and Zeebrugge – Novara 4 m cleared routes, a daily Singen – Cremona shuttle and from February a twice weekly service from Rotterdam and Duisburg to Istanbul Halkali. Hupac is also working with partners to exploit the opening of markets in Iran, the Caucasus and Central Asia.